Some sad news emerged last week from the West Country indie rockers Empty Pools who have announced that front woman, Leah Pritchard, will no longer be part of the band. Having released a scrumptious album, three delicious EP’s, a delectable single and been part of a disgustingly good compilation album with Battle Worldwide Recordings, it’s a shame to see her leave the band. “It’s with heavy hearts that we announce Leah’s departure from Empty Pools; she no longer wishes to do the band anymore. We wish her well and reflect fondly over these three short years. Ironically this sudden news comes just as we have completed a new record that turned out as we’d hoped. It’s a five song EP, aptly titled Liberation Prayers and it’s released digitally worldwide on Monday 28 July via Ben’s imprint Enclaves. The EP’s lead track Pacey Grey is streaming now via Soundcloud and updates on the release will be posted in the coming weeks. Unfortunately, physical release, video and live date plans have been shelved. Owl City has teamed up with RollingStone.com to debut the music video for his latest single “Beautiful Times (ft. Lindsey Stirling)” today. The premiere came just in time for the digital release of the multi-platinum singer, songwriter and producer’s new digital EP, Ultraviolet. Ultraviolet is now available on iTunes. The video for Beautiful Times is a gorgeous and whimsical cinematic tale. It follows a young protagonist waking up and venturing beyond his own world while showing the musician do what he does best. With an imaginative story evocative of the song’s ethereal melodies, the clip channels the distinct and dynamic energy of Ultraviolet. Musically, it also marks the first collaboration between Owl City and Lindsey Stirling who lends her inimitable and impressive violin skills to the track. Across Ultraviolet, the Minnesota native—aka Adam Young—seizes the spirit of his early material while still progressing as is apparent on Beautiful Times as well as tracks like Wolf Bite. Personally, Young has grown into a prolific pop presence. His breakout single Fireflies from 2009’s Ocean Eyes is certified six-times platinum and it landed at number one in 26 countries. Moreover, it’s generated sales of 10 million tracks globally. Again in 2012, The Midsummer Station yielded the double-platinum smash Good Time (ft. Carly Rae Jepsen) also a top five hit in the U.S. Meanwhile, filmmaker Zack Snyder [Watchmen, 300] sought out Young to pen the theme song for Legend of the Guardians: The Owls of Ga’Hoole while Disney tapped him for an original composition in the Academy Award-winning Wreck-It Ralph. His tunes have also been featured in The Croods, Veggietales and Smurfs 2. Peers including Armin Van Buuren and Paul Van Dyk also reached out for collaborations. 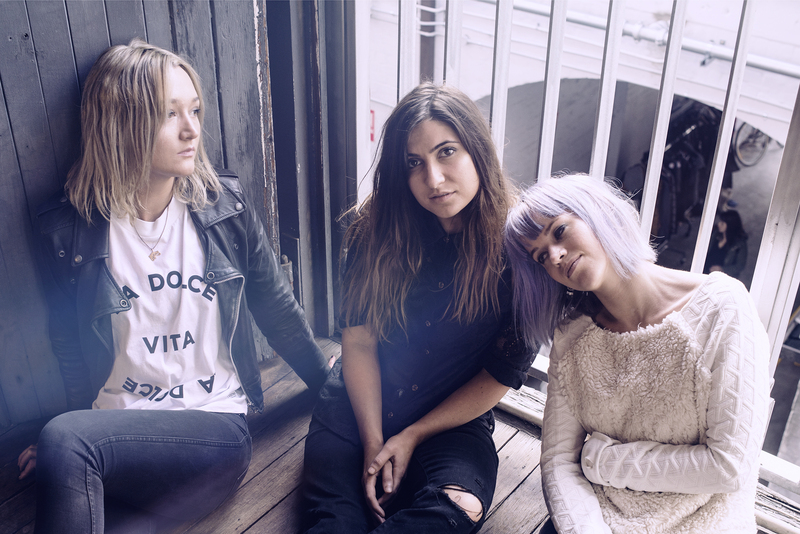 Sydney band Little May have been hailed by international taste makers as one of Australia’s breakout acts of 2014. The band have had close to a million plays on 2013’s singles Boardwalks and Hide, grabbing the number two posts on both Hype Machine and the AirIT independent radio charts. They have just released their highly anticipated new single, Dust. In trademark Little May style, the track embodies what the outfit have become so widely respected for – vulnerable and honest lyrics with an undercurrent of otherworldly darkness. Challenging the listener to hear past the otherwise beautifully constructed song, Dust has a depth that may not be apparent on first listen but will stay with you long after the dust settles. The band have been steadily building their live shows with a successful headline run of the east coast last year, support tour with Mikhael Paskalev and an appearance on the Sydney Laneway Festival line up after being Unearthed by triple j. They picked up a nomination for Next Best Thing at the Fbi SMAC awards, will play Splendour in the Grass next month and have just been announced on the Big Sound 2014 line up. Ajax Ray O’Vaque, the alter ego of Anthony J. Resta, recently announced the release of his new single, Best Days of Our Lives. Resta is considered one of the most prolific American producers of the past two decades, having worked with industry giants such as Elton John, Duran Duran and Collective Soul. Known for his use of vintage gear and soundscaping recording techniques, Resta has woven together pieces of obscure samples from vinyl with twisted analogue synth sounds, melding them seamlessly into his artist’s performance. Resta’s musical prowess has earned him twelve RIAA certified gold and platinum awards. Best Days of Our Lives is the first release from Dreaming in Subtitles, the record slated for a July 1 launch. Resta is something of a musical renaissance man: he has served as a singer, songwriter, composer, engineer, multi-instrumentalist, soundscape artist and holistic music creator. The Canadian-born artist began his celebrated livelihood as a session drummer, moving into programming in the late ‘80s through expertise with the Linn Drum. A chance encounter with Duran Duran led to one of the enduring associations of his career. Lippman Entertainment in Los Angeles signed Resta the same year he built the 3,700 square foot Bopnique, an award-winning studio in New England. Resta and his Grammy nominated engineer, Karyadi Sutedja, expanded Bopnique in 2013 to two new locations in the Los Angeles area. It was at Boston’s Berklee College of Music that Resta discovered his talent for electronic gears and gadgets, helping him define his signature sound heard on Collective Soul’s Dosage, Duran Duran’s Medazzaland and Denise Hradecky’s Save the Universe. Along with his producing and mixing work, Resta is also a successful composer. Some of Resta’s most notable soundtrack work can be heard in films The Saint and Twilight. Resta has no particular favourite style of music: “I used to be into electronica but I really like recording real instruments. I like mixing the most real sounds with one or two completely unreal sounds then making them sound like they belong together.” Best Days of Our Lives is the latest example of Resta’s ability to juxtapose purely organic and wildly synthetic instruments. The song is the first release from Dreaming in Subtitles, Resta’s second album under the name Ajax Ray O’Vaque. Robert Robles, GM of Sterling Sound, calls Dreaming in Subtitles “…an amazing creative experience that is long overdue.” Both Dreaming in Subtitles and O’Vaque’s debut, The Critically Forgotten Demos of Saturn (released by Intelligent Records in 2009), are available on Amazon. Immigrant Union have recently announced the first single and video from their second full-length, Anyway. The video for the new single, I Can’t Return, was directed by Mike Bruce (Noel Gallagher, Black Mountain, Paul McCartney) and stars Omar Doom (Inglorious Bastards) and Carolyn Stotesbery (Love and Mercy). Featuring a psychedelic folk sound that front man Brent DeBoer describes as: “Spiritualised being baptised in a warm bath of Creedence Clearwater,” Melbourne’s Immigrant Union hit the national spotlight in 2011 with their acclaimed rendition of Rose Tattoo’s, Bad Boy For Love, on Adam Hills Tonight on ABC TV. The performance occurred just before the band travelled to Portland, Oregon to record their self-titled full-length debut album with producer Gregg Williams (Sheryl Crow, The Dandy Warhols, Blitzen Trapper). Forged through a chance drunken meeting between DeBoer and Harrow, their shared love of music led to a trip to the country and an all night jam, solidifying a friendship that would form the basis of Immigrant Union. Immigrant Union have already put out a self-titled debut album and will follow it with Anyway later in 2014. Part psychedelic folk, part traditional country rock, Immigrant Union have been building their name through stellar live performances at some of the country’s most iconic venues and boutique festivals. From 2007 to 2012, songwriter Jesse Elliott led rock ‘n’ roll band These United States through five studio albums and nearly 1,000 live performances in the U.S., Canada and Europe, appearing everywhere from Glastonbury to SXSW, Daytrotter to Lollapalooza and garnering praise from NPR, The New York Times, SPIN, KEXP and others. In early 2013, Elliott was stopping over for a month in Denver on his way to a new life in New York but as the members of Ark Life met each other, journeyed into the mountains and started playing music together, it became clear he’d have to stick around a little longer. The Dream of You & Me is a mile high ocean of uplift, equal parts mischief and heartthrob, that pulls as much from contemporaries like Heartless Bastards, Elvis Perkins and Sallie Ford as from the band’s enduring loves for CCR, Motown, Tom Petty and the classic campfire singalong. Fifteen months and 150 shows in, the garage-soul upstarts have toured coast to coast, sharing stages with Of Montreal, Gregory Alan Isakov, PHOX, The Moondoggies, The Head & the Heart, Mount Moriah, Ryan Bingham, J. Roddy Walston & the Business, Ha Ha Tonka and more. Ark Life has just announced summer tour dates including festival sets at Green Box Arts Festival & Joshua Tree Music Festival as well as a run of dates with Portland’s Quiet Life.